Tony & Janet Overland moved to Stonyford Cottage with their 3 children over 35 years ago. It was then a derelict cottage with swampy gardens, which would be unrecognisable today. Tony’s love of garden’s started as a student at Kew Gardens, where he gained professional qualifications for his knowledge in plants. This has since been passed down to his son’s Philip & Andrew, who each have continued qualifications in both Landscape Architecture & Landscape Gardening. Over the years the garden was created and developed with the first footpath to the other side of the lake being the ‘Embankment’ pathway. This was the only way across the lake initially until Andrew opened the Plant Nursery in 1994. This was when it was decided to erect the two bridges across the lake, therefore joining up the garden to the plant nursery. 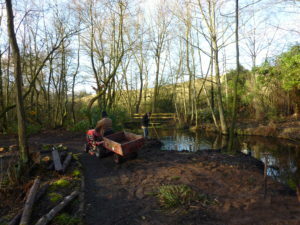 Since then there have been further pathways and wooded walkways constructed that opens up the once undiscovered swampy woodland area where visitors can now spot an array of woodland and water wildlife. 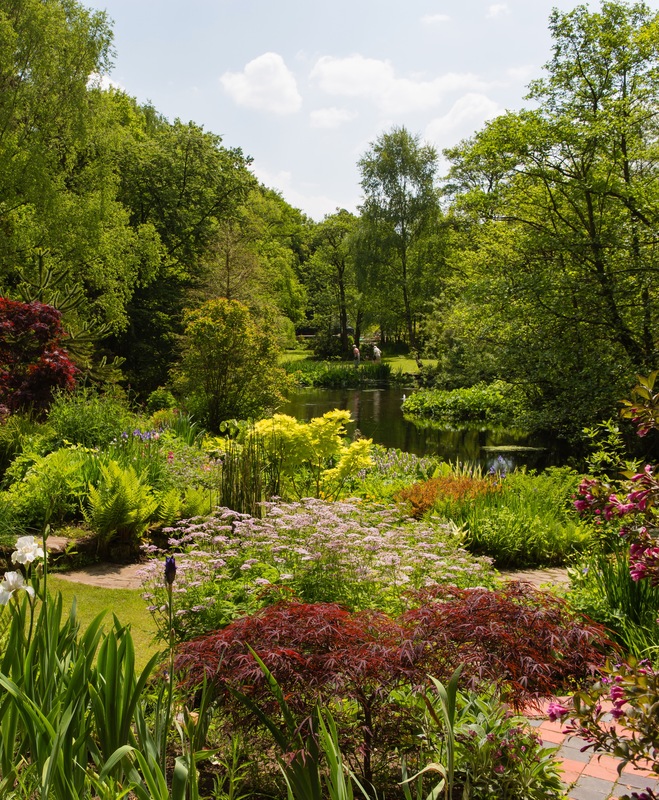 The Gardens have been lovingly created over the years and have been on ‘Gardeners World’, ‘chosen as one of the Top Ten Spring Gardens in the Telegraph’ and is one of ‘Cheshire’s RHS Partner Gardens’. The vast array of plantings and beautifully created borders are a ‘must see’ for the Garden lover. These gardens truly are magical. Tony & Janet’s daughter Carole has since joined the business where she has used her IT & Marketing skills to develop the business further, as well as setting up the New Tea Room where customers can enjoy the Scrumptious Home-Baked Cakes & Delicious Home-Made soups as well as the freshly prepared lunches. Stonyford Cottage Gardens is a nature lover’s dream, a gardener’s dream and a cream tea lover’s dream! The business has three main attractions – Plant Nursery, Tea Room and the Beautiful Gardens. Cyclists & Walkers are very welcome at Stonyford, as this is now a popular ‘stop off’ on the way to Delamere Forest and is located very close to the Whitegate Way and metres away from the new ‘Oakmere Way’ creating a great new walk/cycle ride through to the forest. Horse riders are also very welcome to stop by for refreshments. Group Bookings are welcomed also, and we offer various garden tour packages including lunch & cream tea. Please contact us for more information. 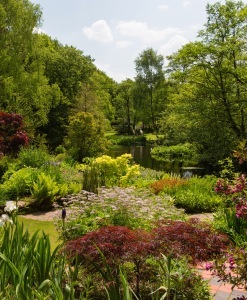 The Gardens, situated behind the Tea Room and Nursery, were created from a wetland area around a tranquil pool in a sheltered valley on the edge of Delamere Forest. This is an informal garden where shade and moisture loving plants including Candelabra Primulas, Astilbes and Hostas grow amongst natural wooded areas. As specialist plant growers for twenty years, we grow a good range of Perennials, Shrubs and Alpines. We sell quality plants here and all over Europe, we pride ourselves in supplying many rare and sought after varieties. Set in a beautiful garden setting, our tea room serves a good selection of tasty snacks and light meals, including paninis, jacket potatoes, quiche & sandwiches. Enjoy our Scrumptious home-baked cakes, Tea Cakes and wonderful Cream Teas. The gardens are popular with photographers and artists – one of the bridges, in particular, is very reminiscent of Monet’s flower garden at Giverny. The gardens provide a stunning back drop for Weddings and other special occasions and a large marquee is also available, which can seat 60-80 people, with the Tea room seating up to 50. For more information & enquiries, please email: info@stonyfordcottagegardens.co.uk. Each summer Stonyford plays host to an Outdoor Theatre. Further events held at the gardens include Willow Sculpture and Stone Carving courses and Plant Hunters Fairs, from specialist nurseries. Disabled Access: Most areas easily accessible via gravel paths, although there are some steps.